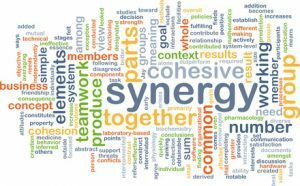 Positive team synergy is operating when the outcomes a team creates, together, are far more innovative, effective and remarkable than if members created those solutions, individually. The output sum is greater than the individual component parts. And just how much greater? Think about how – or if – you experience random or intentional, positive or negative team synergy. These positive or negative examples occur not only within your own workplace, but also within your clients’ houses, as well. You have internal colleagues and external clients who bring out the best in each other. When that happens, it’s magic. Outcomes are sustainable, remarkable and enduring. You cannot wait for the next opportunity to collaborate. And because of this continual positive synergy, individual performance improves, contributing to an even greater positive synergy at next collaboration. Then again, toxic teams and clients create negative synergy. Instead of the whole being greater than the sum of the parts, there is no whole created. Or, at best, the output of toxic teams and clients is subpar, unremarkable and transient. Not only that. The amount of energy required to sustain teams characterized by negative synergy is daunting. There is no magic created by these teams on behalf of clients. Instead, these teams become addicted to the habits necessary to maintain negative synergy. Are you having difficulties with negative team synergy in the workplace? Download this team assessment tool on overcoming impediments to collaboration and decision making. Whew. If you think it sounds exhausting to describe a team characterized by negative synergy, then why are there so many teams like this in organizations? Creating teams characterized by positive team synergy takes courageous and collaborative leadership – from all team members. First, you will make some hard calls, together. Then, you will rock some boats, together. Also, you will disagree, collaboratively, together. And when you are stuck, you mutually recognize you have hit a roadblock. As a result, you seek outside resources for positive contributions. Together. This positive synergy means that, in spite of challenges, everyone has each other’s backs, instead of being at each other’s throats. Rather than a loyalty to the team, there is a courageous commitment to the power of the team’s collaborative process. Even when profound and uncomfortable Change is called for. That is why remarkable teams involve continuous momentum and hard work. However, because of the positive synergy created when the team collaborates, this hard work becomes second-nature and, therefore, is effortless. Everyone becomes a far better version of themselves, professionally and personally, as a result of working together on behalf of clients. The interesting thing about becoming part of a remarkable team is that the experience sticks with you, it is embedded in your professional DNA. As a result, you expect every experience, with other teams, to become equally remarkable. How about moving one millimeter outside your team’s current comfort level and targeting positive team synergy? That is professional innovation, in my team playbook. Click here to contact me. Discover how my workshops and keynotes can help you, your teams and your organization to leverage courage and collaboration for remarkable team outcomes.